I have a regular search in eBay that sends me alerts when period items I'm interested in are listed; one of them is appliquéd quilts. 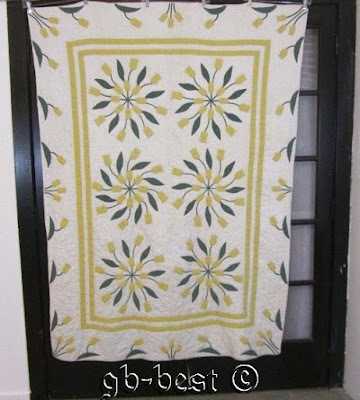 I'm surprised by how many stunning period quilts are listed right now. I really don't need quilts, because I already have 7 pieced quilts I've made myself for our 2 beds, but it is always fun to see what's out there. Just in case any of you are interested, I'll include some of them here. This GORGEOUS cotton 30's Mountain Mist "painted poppies" quilt is hand appliquéd and hand quilted, with hand embroidered accents. 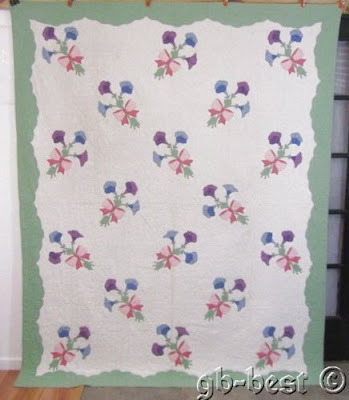 There is quilting around the appliqué and in straight line, grid, and poppy designs in the background, all at an even 7-8 stitches to the inch. The back is white, the hand stitched binding is solid green, and the batting is thin. It measures 70" X 84" and is in excellent, sturdy condition, with a couple of tiny, faint age spots (hard to find) and no wear. $1,195. 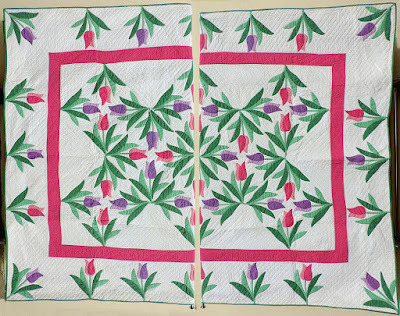 The pattern was design in 1910 by Webster and published in the January, 1912 issue of Ladies' Home Journal. Webster's pattern brochure emphasized the "dainty flowers arranged with leaves and buds in graceful trailing vines." 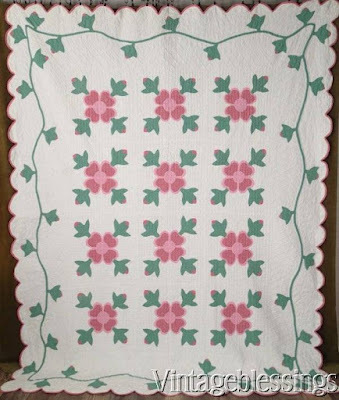 The original pattern was done in blue and green only, with a postage stamp border, while this one includes pink flowers with an open/white border. 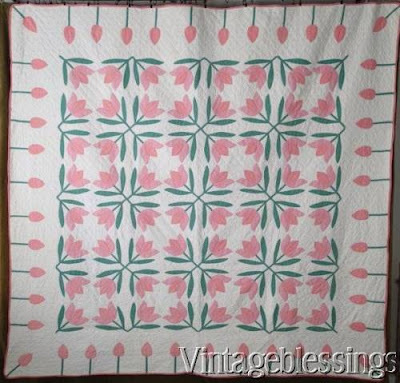 The quilting is superb, with quilting around the appliqué and in 3/4" grid, feathered, and pinwheel designs in the background, all at an even 8 stitches to the inch. The back and hand stitched binding are white, and the batting is thin. The quilt measures a generous 78" X 82" and is in excellent condition, with the occasional light age spot and no wear. $1495. WELL QUILTED Vintage 30's Grapevine Appliqué Antique Quilt ~GREAT BORDER! This GORGEOUS cotton 80's (some fabrics are earlier) ocean waves/streak of lightning/zigzag quilt is hand appliquéd and hand quilted, with hand embroidered accents. 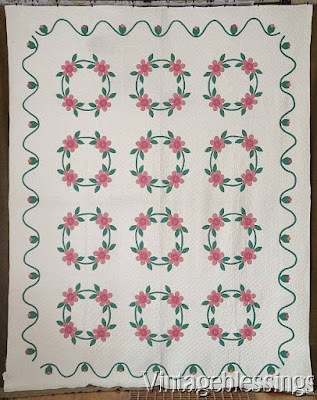 There is quilting around the appliqué and in elaborate straight line, grid, ripple, and feathered designs quilted throughout at an even 10-11 stitches to the inch. The back is white, the hand stitched binding is solid green, and the batting is thin. It measures 76" X 90" and is in very good condition, with some light age spotting in places and no wear. $595. c1930-40s. An amazing quilt for the ages, incredible handwork and hand quilting. 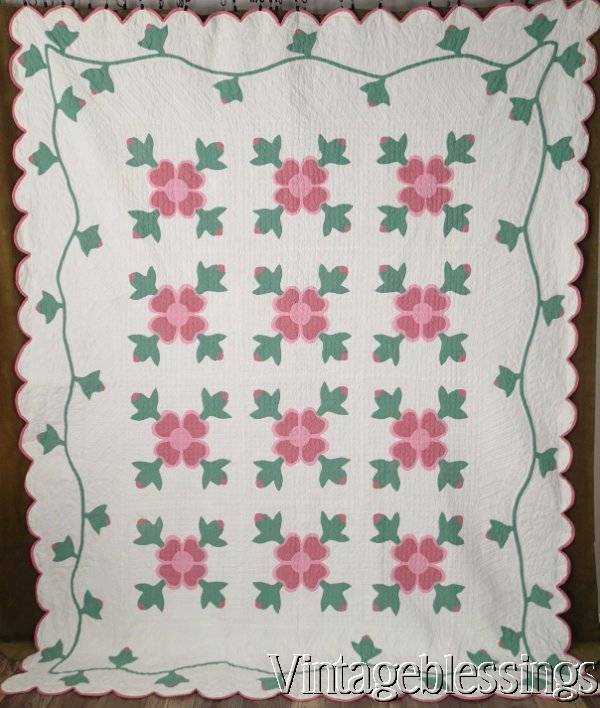 This quilt has a soft white background with pattern of appliqué florals, vines and leaves in pink and green. There are light pencil pattern marks where she carefully marked her pattern. This beauty was expertly made and then stored safely away, never used or washed. It is expertly hand quilted at 8-9 stitches per inch and has quilted grid work throughout the entire ground with squares that measure just 3/4" x 3/4”. It is hand appliquéd and hand bound. It measures 93" x 73”. $695. c1930-40s. A gorgeous design of pink tulips, and green leaves. with an off white background. It is hand quilted at 6 stitches per inch, densely covering the entire ground. It is expertly machine appliquéd. It is hand bound. Measures 85" x 83”. $395. c1930s. This quilt has a beautiful pattern called “Rose of Sharon" on a green background. Wonderful edge detail. It is hand quilted at 6 stitches per inch. It is hand appliquéd. Hand sewn together. It measures 89" x 73”. $265. A beautiful quilt from the c 30s with lovely morning glory applique flowers in purple and blue. Each bouquet is tied with pink bows! Hand quilted 8 stitches per inch. Applique is hand sewn. Batting is thin. 93” x 75”. $495. 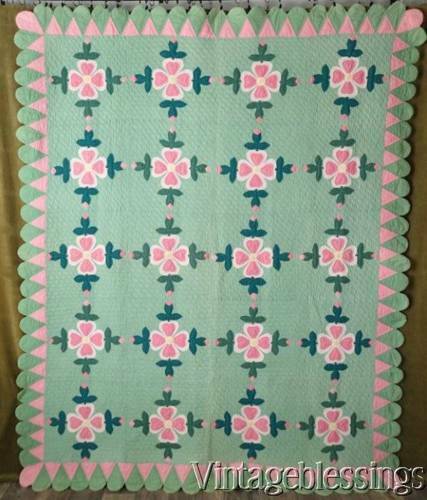 Totally beautiful and expertly made, this vintage quilt is in totally excellent condition, no areas of wear to be found. Freshly hand washed and air dried. All stitching intact and solid. 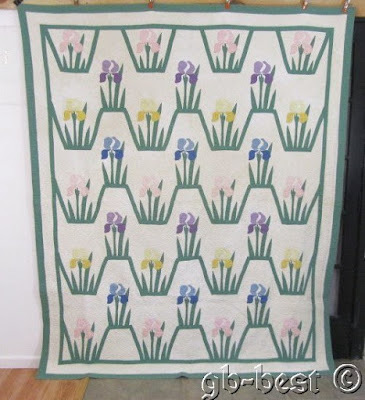 Beautiful design of 2-tone pink and purple tulips with green leaves outline the entire quilt. A bright pink band sets off the inner tulip garden. Diagional quilting keeps the inner batting in place. Finished with green binding all around the edge. Near Pristine - 6 Colors on White. 94" x 75”. $345. The original pattern was inspired by Marie Webster in 1911. It was later copied by Mountain Mist batting where patterns were offered as part of the paper around. The design was changed slightly. The quilting is very fine with tiny stitching. Hand bound and appliqué is hand sewn. Hand quilted 20 to 24 stitches per inch. Batting is thin. Measurement: 77” x 54”. $595. c1920-40s. An heirloom quilt that was made and never used, stored safely away for nearly 100 years. 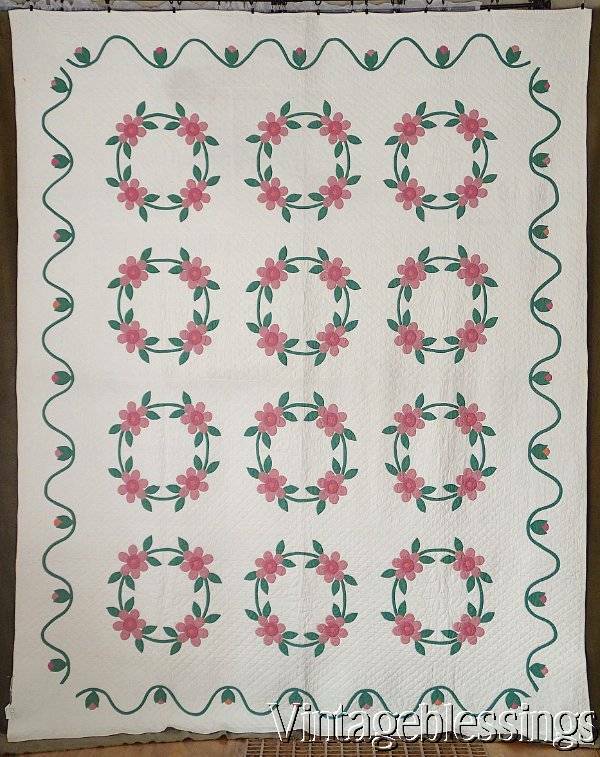 Gorgeous pattern of "Rose of Sharon" with a beautiful border detail of rosebuds and vining. This quilt has a creamy, slightly off white background. The hand quilting is a stand out. There is fancy, and dense patterns throughout. It is masterfully hand quilted at 9 stitches per inch and has quilted grid work with squares that measure just 3/4" x 3/4”. It is expertly hand appliquéd and hand bound. Measures 98" x 78”. $595. c1930-40s. A stunning example of very fine quilt making. This quilt has a very light cream background with soft pinks and greens. There are some very light pencil pattern marks where she carefully marked her pattern. Never used, we hand laundered for the first time, to freshen from long term storage. It is masterfully hand quilted at 10 stitches per inch and has feather wreaths and quilted grid work with squares that measure 3/4" x 3/4”. It is hand appliquéd and hand bound. Measures 71" x 71”. $565. This beautiful c1930s era appliqué quilt with iris flowers with pastels in solid pink, green, yellow and others. Solid lavender on back. 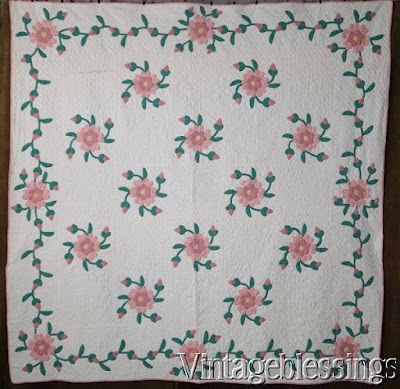 The quilting is EXCEPTIONAL with tiny hand quilting that measures 12-14 stitches per inch. Edges meet. Appliqué is hand sewn. Batting is thin. Measurement: 92” x 76”. $395. c1930-40s. A wonderful array of pink roses and blue forget-me-knots, all hand appliquéd on a white cotton background. There are some faint light blue pattern marks under the quilt stitching. It is expertly hand quilted at 7-8 stitches per inch, it has quilted feathered vines and quilted grid work. It is hand appliquéd and hand bound. It measures 84" x 73”. $495. 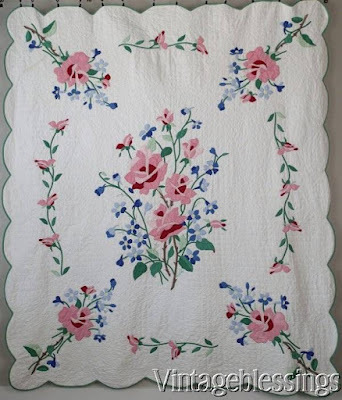 This BEAUTIFUL cotton 30's spring bouquet/tulip quilt is hand appliquéd and hand quilted, with hand embroidered accents and a scalloped edge. There is quilting around and within the appliqué and in close grid, rope, and feathered wreath designs in the background, all at an even 6-7 stitches to the inch. The quilt is a kit pattern, so there are tiny, pale blue dots in the background showing the quilter where to quilt. The back is white, the hand stitched binding is solid green, and the batting is thin. It measures 76" X 88" and is in excellent condition, with a couple of small, faint age spots (hard to find) light surface dirt in a couple of places, and no wear. The quilt feels strong and sturdy overall. $975.